Accessorize your hair in style! You can make so many different types of hair accessories with a crochet hook and some fun yarn that it's hard to stop. The projects are super quick, great for beginners, and it's possible to get quite a few done in just one night. With these free patterns, you'll be making headbands, hair bows, scrunchies, snoods, and more for yourself and everyone you know. Once you learn how fast it is to crochet your own scrunchie, you will never buy one again! Maize Hutton offers a basic scrunchie pattern that works a couple rounds on an elastic hair band. You can follow her pattern then create your own on the next scrunchie. Make them in different colors and you'll have a ponytail holder ready for every outfit. Headbands are so easy to crochet and they're useful. They keep the hair off your face in the summer and wide headbands can help keep you warm in winter. This is a simple, beginner-friendly headband pattern. It's worked in worsted weight yarn and uses just two basic crochet stitches. If you're looking for your very first crochet project or a quick gift, it's perfect. 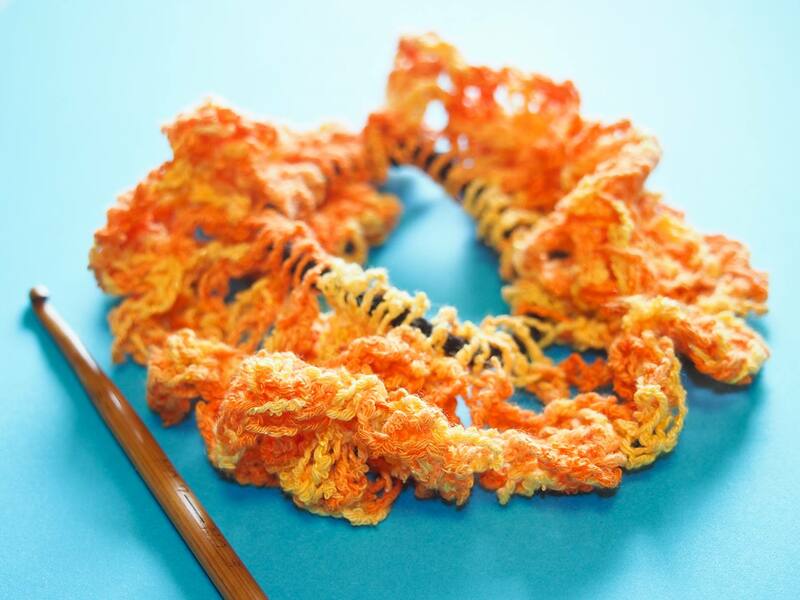 With that headband under your belt, you can add another stitch to your crochet repertoire. This easy headband pattern features the double crochet stitch, which you'll use often in future projects. It also comes together quickly and is super warm and comfy when crocheted with wool yarn. Ear warmers are headbands that are designed specifically to keep you cozy on cold days. The patterns tend to be chunkier than the average headband and come in lots of cute styles. From bows to cables and braids, these are excellent little projects for practicing new skills. This design includes a matching scarf. DROPS Design has some of the neatest knit and crochet patterns you will find. They tend to have a hip, modern flair, and this flower child headband is a perfect example of their free patterns. Worked in a thin, lightweight yarn with two different sizes of flowers, it's the perfect accessory for summer outfits. Super cute, hair bows are possibly the fastest crochet project you'll take on. It's easy to get a bunch of the adorable bows done in one night and they're perfect gifts for little girls. The tutorial from Happy Together gives you all the details, including instruction on how to glue the bows onto barrettes or hair clips. Put your yarn stash to good use with this simple pattern from Ambassador Crochet. The cute flower barrettes require just two rounds, so you can whip out lots of flowers in no time. If you're new to working in the round, it's a wonderful introduction. Hair spirals are quick projects that create a perfect accessory for pulling back long hair. Danyel Pink Designs shows just how easy they are and it takes just 15 minutes to make one! Crochet these up in different colors and at various widths and lengths so you have one ready for any occasion. If you wear your hair in a bun often, you'll want to make this stylish crochet bun cover from Don't Eat the Paste. It has a delicate, classic style to the mesh and a beautiful floral feature in the middle that is reminiscent of a traditional doily. You can resize it to fit however much hair you have and you'll learn a fantastic V-shaped cluster stitch at the same time. Snoods are back in fashion and they're fabulous for long hair. Whether worn low or up high like a headband, they're really comfortable, too. Suzie's Stuff has a classic 1940s style snood pattern that you won't want to miss. It's worked in cotton thread and incorporates a ribbon or piece of elastic to tighten it up around your hair.